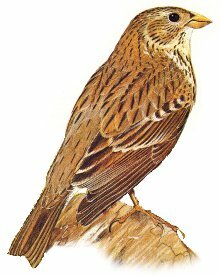 The Corn Bunting is a large heavy bunting with a mostly plain brown streaked appearance, pale breast, distinctive dark eye and yellowish bill. Often seen flying with legs hanging down in the breeding season. Resident breeder across most of Southern Europe. 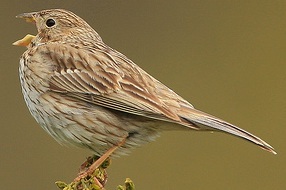 Once a common bird in the UK, the Corn Bunting is in serious decline and now breeds only very locally, primarily in central England and the Western Isles in Scotland. A bird of arable farmland, changing practices in farming has moved the birds strongholds to areas of rough pasture and scrub, managed for nature. A now rare sight in the British countryside the Corn Bunting was once a bird that formed huge flocks on arable ground, preferring wide open featureless areas without hedges. A large plain bird but none the less impressive, the male Corn Bunting is often seen singing from a fence post and flying with legs hanging down as part of his mating season display.